Marcus Peters returned a fumble 45 yards for a touchdown. KANSAS CITY, Mo. 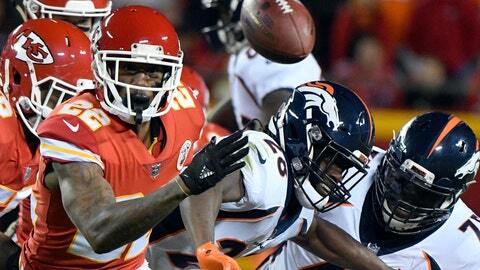 — The Kansas City Chiefs proved Monday night they can play a little defense, too. “That definitely changed the dynamic of the game,” Chiefs defensive tackle Chris Jones said. “I want the ball every single play. That’s just how I grew up playing,” he said. The Chiefs were threatening to put the game out of reach later in the first quarter when Reid got cute with the play-calling. Rather than keep the ball in the hands of Smith, who hasn’t thrown a pick all season, he let wide receiver Tyreek Hill throw it — and he was intercepted in the end zone.